Take a trip to tin town and meet all its mechanic inhabitants. 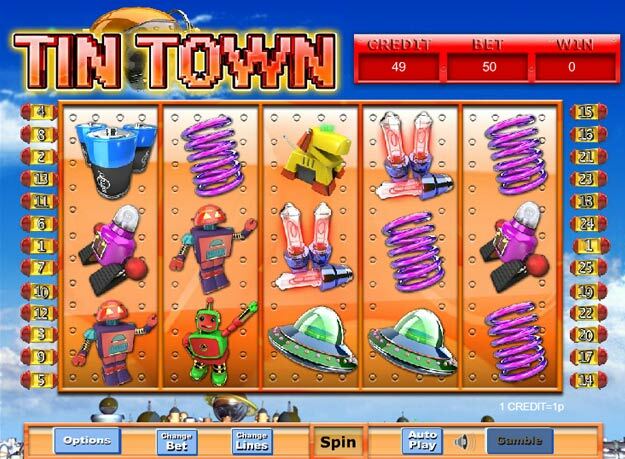 Tin Town is a town dedicated to robots and slots online gaming. Spin your way through this endearing 5 reel and match batteries, nails, and screwdrivers to earn yourself some wonderful cash prizes in this 26 payline online slot game. Eyecon is part of the small but well-established group of software developer companies in Australia, which provide online slots and gaming technology to the wider global industry. This Brisbane developer has been around since 1997, and has over 100 online slot machines in its portfolio. You don’t remain in business for so long if you aren’t able to keep up with the times, and Eyecon has started to release a number of its slot machines to the mobile betting market. Some of their most popular titles are now available to play slot games now on Android and Apple iOS powered devices. Discover our new casino slots free spins today! 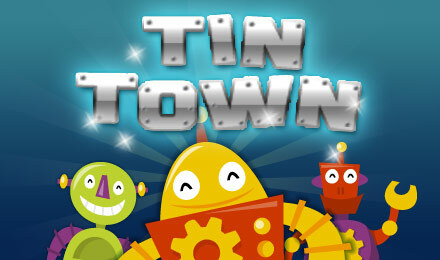 Tin Town is a charming online slot game about a Robot that needs your help. If you loved robots as a child, and wanted nothing more than the opportunity to be able to build one yourself, you are going to fall in love with the theme of this online slot game. The game is filled with batteries, springs, nails, and everything else you would need to repair the Robot and bring him back to life. This is a 5 reel, 25 adjustable payline slot game. To receive a payout you only need to match up 3 of a kind symbols, and with 15 symbols appearing in every spin the chances of this happening are high, so you may want to consider activating all 25 paylines so you can make the most out of this. The reels set against a clear blue sky, and the foreground is a city that is made up of robot pieces. The reels themselves are pieces of iron, studded together with rivets. The Wild symbol in Tin Town is the Dancebot, this will substitute for all other symbols except the Scatter to help you form even more winning combinations. Just 2 of these symbols in a line will earn you 10 coins, and if you’re lucky and you land 5 on active paylines you’d take home an impressive 9, 500 coins! This is why it’s important to activate all of your paylines. This Wild will also boost your prize on other winning combinations. For example, if you had 5 spring symbols on the same line, and a Dancebot was also on the screen, your winnings from that combination would be boosted from 100 to 200 coins! The Dogbot symbol is the Scatter icon, if you land 3 of these anywhere on the reels in one spin you will trigger 15 Free Spins. All prizes are doubled in the Free Spins round, and you could even trigger more spins during the round up to a maximum of 15 times! Add that in with the double boost from landing Dancebots and you could be taking home some huge winnings here! Tin Town is a really happy place, the robots even have Dogbots! You’ll be thoroughly charmed by the theme in this online slot game as it brings out the inner tinker in you. You’ve got Free Spins and boosting Wild symbols, you’ll turn into a dancing robot yourself with this energetic game from Eyecon. Here's another excellent slot at easyslots.com! Claim your free spins here at Easy Slots.